Every spring the Audubon Society opens up their bird banding station to the general public. This free activity is available to all ages from 7:30am – 11am every Saturday and Sunday (except May 9th) from April 25th – May 31st. Bird banding is the action of attaching a metal band around the bird’s leg for research purposes. It is the hope of ornithologists (researchers who study birds) that the same bird will be caught in succeeding years so that documentation of physical appearance, migration patterns and other pertinent data can be made. In order for banding to happen, nets are placed along the tree line of the Denver Water property where the birds are caught. Trained volunteers then gently remove the, on average, five birds a day. It is then the responsibility of Ornithologist, Meredith McBurney, to document the findings. The process takes approximately 20 minutes and then the bird is released back into the wild. Meredith McBurney, of Rocky Mountain Bird Observatory, will educate the public on the birds that she bands including close-up viewing and occasional hands-on involvement. 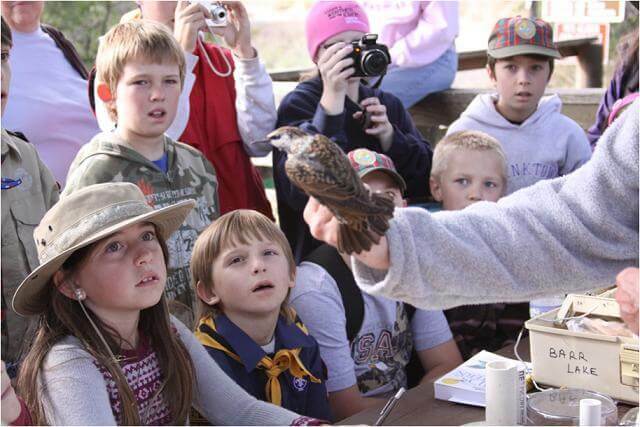 So head over to the Audubon Nature Center for this fun, educational and free activity for all. Parking is also free and bringing picnic lunches is encouraged. If you’re interested in organizing a group for this activity, early morning slots, Monday – Friday are still available. A donation of $10 (adult) or $5 (child) per participant is necessary to support the Audubon Society of Greater Denver. For more information, please contact Kate Hogan at 303-973-9530 or at communityoutreach@denveraudubon.org.